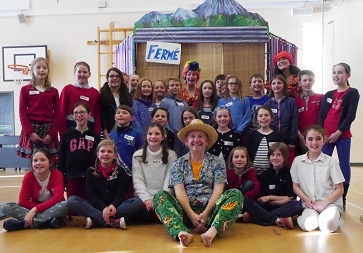 Year 5 pupils from schools around Leeds, Harrogate and Wharfedale came together to practise their language skills during a French Day at The Grammar School at Leeds (GSAL). During the day the children enjoyed French food, played French playground games and watched a play, Contes Mauriciens, based on folktales from Mauritius and performed in French by Théâtre sans Frontières. It was a non-uniform day – the children came dressed in the colours of the French tricolour. The schools taking part were Horsforth Newlaithes Primary School, The Froebelian School, Brackenfield School in Harrogate, together with two Leeds schools – Richmond House and Talbot Primary – and two Ilkley schools – Sacred Heart and Ashlands. GSAL Junior School’s own Year 5 joined in the fun. Cast members from Théâtre sans Frontières are pictured with the pupils visiting GSAL.